We discussed driving at beer night tonight, including the possibility that driving will disappear, leaving a market opportunity for entrepreneurs to allow you to drive non-autonomous cars on their property for a fee. Driving for yourself may become too expensive to insure. We won't be forbidden so much as gradually move away from it. Young people may want to get together as they always have, but the amount of communication they can do on their devices will diminish their need to be in the same physical location as much. When I was a teenager the psychological pressure for getting together was greater. You can only phone one person at a time. The modern teenager's aquarium can include many fish at once. There are parts of driving we will be glad to give up. When our cars can automatically handle bumper-to-bumper on the highway - and flow more smoothly because they are in communication with each other - we will be glad to turn on the automatic and take a little nap. Little naps will be welcome on long trips as well, even if we like touring under our own direction most of the time. In fact, even those of us who like long trips will find the number of hours on automatic go up year by year. Parking lots are a nightmare, and we will accept automatic driving for ourselves as the price for requiring it for all those other knuckleheads. Yet there are parts of driving that I do very much like, that I do not find to be a chore. It has been fun to contemplate what parts of the driving experience I find very pleasurable and will cling to* as long as I can. I won't tell you mine. *A new meaning to "bitter clinger." The joke in plasma physics is that controlled fusion is just 20 years away, and always has been. I'm seeing this more as an option for a long time. I vaugely remember when speed control started to be offered as an option in the 1970s. It seems like it took at least 20 years before it became common enough to be considered standard equipment on all but the most bare bones cars. "-large roads, limited number of start and end points--you could even dedicate automatic truck lanes on the big highways." Sounds a lot like trains. Donna: Exactly. They'd be a little more flexible since you could redefine a "track" by fiat, and not as efficient as trains. I guess I'd do about what I used to do when flying, or what I do now when my husband takes the wheel: crochet or audiobooks. I listen to audiobooks already, when I'm the driver. Well, that and scenery-watching. We both like seeing what the grass and wildflowers are doing. T99, they're POLLINATING! In PUBLIC!! I personally suspect that there is, coming very very soon(within 20-30y, if not even sooner), a generation that will actually "rebel" by disconnecting. They probably won't actually get rid of their phones, but they'll minimize their use of them. There will be less videogaming, less social media usage, less everything electronic than any generation since 1970. These things run in cycles, and one of the clear ways left to rebel is to be OFFline as a pattern of regular behavior. You heard the notion here first. 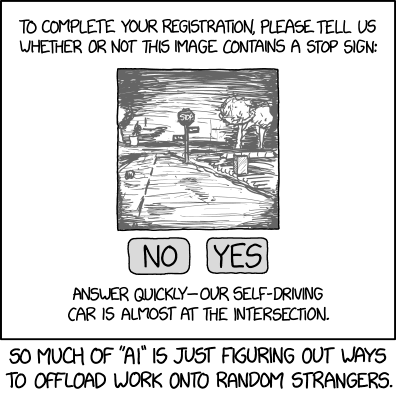 I think self-driving cars are in a similar situation. Indeed. I think this is idiots trying to do the whole job (like automated postal sorting) using overcomplex tech when a base tech can do a lot of the job, enough that people won't care as much about the other part. 95+% Mail sorting could have been almost fully accomplished THREE DECADES ago if they'd just set up and encouraged (mailing discounts) a BAR CODE system for delivery -- that is, design a bar code that has all the info the sorting system needed to take a bag of mail and route it to the mailman who puts it into the box. The sorters could have handled this back in 1990. Instead they went for full handwriting recognition, and still don't have it down. WE COULD HAVE MADE THESE SYSTEMS 10-15 years ago, EASILY. And monotonous highway driving is the best damned usage of the tech, anyway. Trucks can be semi-autonomous (i.e., people take over when they leave the highway) and cars, too. And in the meantime, the drivers can read, watch a video, play a videogame -- whatever. Sure, fully autonomous cars will be great. It'll be like everyone having a chauffeur -- it'll ease parking and traffic concerns in a lot of ways (the driving can be handled far more efficiently, planning can be done much more effectively, and parking does not need to be in the same vicinity as destinations. And you can justify a 30 story parking garage to serve a 30 block district. UBER also becomes even more effective. Best Red Sox Team Ever?